Oh, no. Serious post time. Some of you hate when I write super serious posts, so if you are one of those, please allow me to direct you to this today, instead. Serious post starts now and it's going to be a long one. I don't do these too often, but this one is important, so if you have time, stick with me. 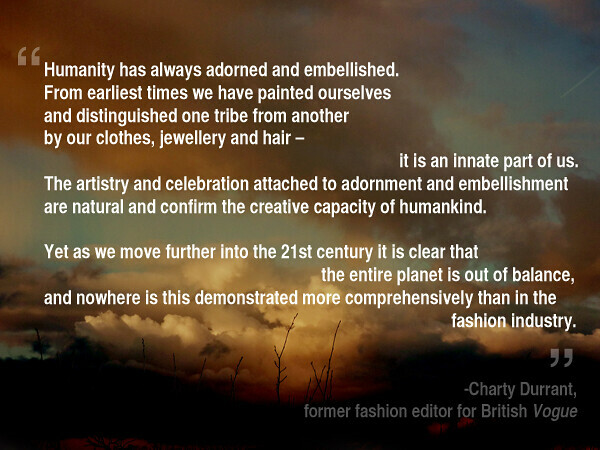 A few days ago my friend Merl Tweeted this article on the Etsy blog: The Tyranny of Trends. Please go read it. I implore you to read it with an open mind. It's really long, but basically it cautions women to stop being blind consumers with regard to fashion. It talks about the environmental impact (which we've all heard before) but it also talks about the social and emotional impact of chasing trends. This has been something that has been churning up and boiling around inside me for about nine months now. I've been trying to pinpoint the feeling in my gut and articulate it ever since my disastrous attempt at 30x30, and I haven't been able to synthesize things or write about it candidly until now. My thoughts are still a little jumbled, but at this point, I feel like I can't squash down and bottle up and ignore everything I'm feeling anymore. I grew up poor. Raised by two retired maintenance workers, I come from a blue collar family who shopped at thrift stores and yard sales not because it was cool and trendy, but honestly, because it was all we could afford. My grandmother (who raised me) was excellent at bargain hunting and even opened her own resale shop when I was a kid. I didn't have a lot of new things unless it was a gift from my estranged mother or was from Walmart. I'm a great thrift store shopper because I grew up doing it. When I went to college, I discovered credit cards, got fat checks from my mom, and was on scholarship to attend. On a regular basis I went nutso crazy bananas and would take day trips to Chicago and fill an entire taxi with purchases from Old Navy, Express, and Urban Outfitters (nothing fancy-- I preferred to buy in bulk and it never even occurred to me that there was anything fancier than Express!). It got so out of hand that I had to rent storage to contain it all. When I had spent everything I had, maxed out all the credit I was given, lost my scholarship, stopped getting checks from my mom, and was unable to pay for storage, I finally realized that I had adopted some sort of scarcity mentality with clothing. Financially, I hit rock bottom. I was the girl with the clothes and my clothes had consumed me and my identity. I was unable to pay for my storage unit and they took and auctioned off everything. I was left with a meager amount of clothing and the resolve to start over well. My grandfather paid off my credit cards with a command to never get one again. I listened and I haven't had one since. Over the following years, I started to buy more thoughtfully. I was on a comfortable pace there until my blog started attracting a little attention. Then the store credit started coming. And the sponsors. And the requests for reviews. But most damaging was the unquenchable thirst to have all the new thing that my blogging peers had. And slowly, over time, I found myself back to where I was before: an over-full closet and an aching heart of guilt. My closet has been out of control for a long time. Remember when I was disgusted with myself for having seven bags of clothes that I easily parted with to donate to charity? 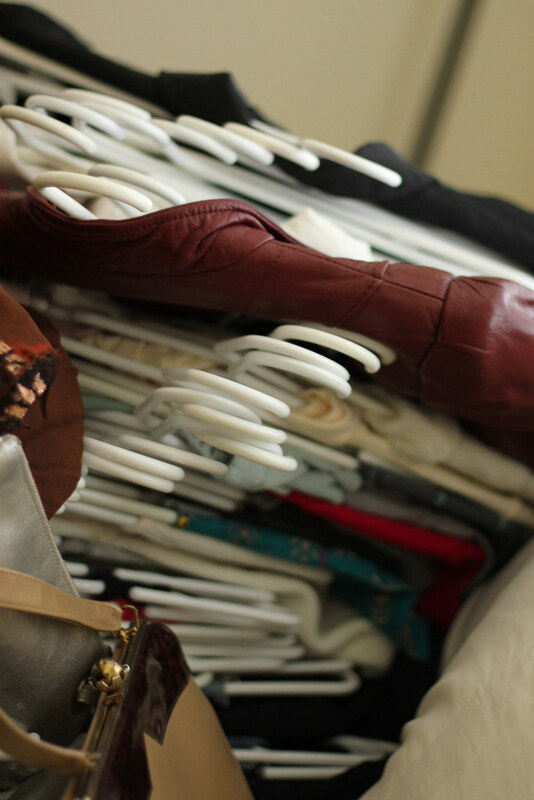 I could not believe that I even owned seven trash bags of clothes let alone seven trash bags of clothes that I hardly ever wore. I had become the girl with the clothes again. So here I am, chewing on some big, big things lately. I wanted to let you know because I really love Adored Austin and you (the people who are reading this) and the advertising partners I've worked with over the years. For the last couple of days, it's been really tempting to just hit DELETE BLOG and endeavor to start over somewhere new, but that's just silly. Instead, I see this as a great opportunity to redeem my blog and challenge myself (and maybe even others) to shop more thoughtfully. These guidelines are in place for not only the things I buy but also for the courtesy items I receive, the brands that I work with, and the giveaways that I do. I will encourage Adored Austin partners to carry more items that fall into these guidelines. 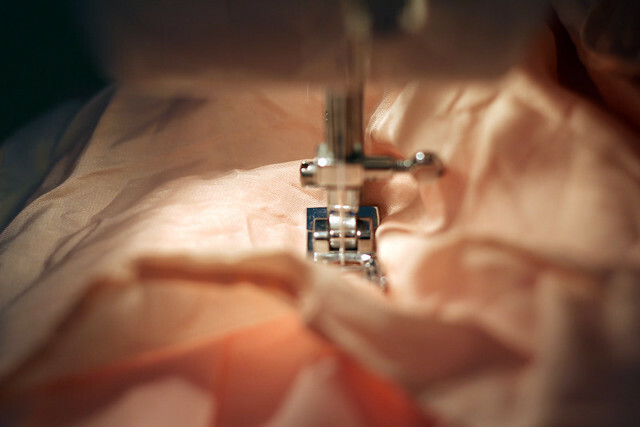 In the reviews that I do, I will candidly say where the garment is made. I don't want to burn any bridges here, instead I want to welcome and perhaps even help usher in change. Maybe I'll have an upcycled clothing line one day. My main goal is to promote a new way of thinking in the world of style blogging: instead of chasing all the new trends, I want to encourage women to consider pieces that can transition from season to season and from year to year. Just because an item is cheap and on-trend does not mean it's a necessity. I want to start thinking with my heart in terms of shopping. I plan to promote upcycling, vintage clothing and swapping more, and I plan to publish a guide of online retailers that offer a great selection of made in the USA clothing, vintage, or eco-friendly clothing. This means that instead of being an "affordable fashion style blog" I will start showcasing a wardrobe that has still has a relatively low cost per wear but above all were purchased with heart and thought. Here is the tidbit of honesty that is hardest for me to share, but here goes: I am starting to believe that when a blogger starts blindly taking on brand partnerships and the same brands work with so many different bloggers, it gets harder for the blogger to maintain her unbiased editorial voice. When entire outfits for weeks on end are nothing but courtesy items and the same brands are splashed across the same 50 blogs, it gets muddy for readers (what's advertisement/promotional content vs. what's unbiased?). Let's face it: no style blogger is going to bite the hand that dresses her. It gets harder for a brand to stand out from the other brands on the blogger's site. It gets harder for the blogger to make her content stand out from the other blogs. What seems like a mutually beneficial relationship to both the blogger and the brand actually gets diluted. So for me, this means that by having these new guidelines, I can assure my readers that Adored Austin is not a shill blog. From here on out if you see a new courtesy item, it falls into my guidelines and I accepted it or picked it out with a lot of thought or will say explicitly otherwise. This may mean that I cut down the number of brand partnerships I take (and it will certainly mean that I get approached by fewer brands). I do need you to know that from the get-go I have only partnered with brands that I myself use (and to date have turned down 75% of brands that have approached me), but from here on out, I'm going to be even more discriminating about what companies I work with and what items I accept. Since 2009, I have been given so many opportunities with Adored Austin: I now write for Lucky Magazine as part of their style collective, I co-founded the Texas Style Council, I was asked to speak at South By Southwest on blog/ brand partnerships, but most importantly I have grown a loyal readership who values my opinions and I've been able to make friends with so many more people that I've met through my blog. Doing Adored Austin continues to be a joy for me. While not my full-time job, it has my heart full-on.